Pear shaped diamonds are a cross between the classic round brilliant cut and the football-shaped marquise cut. As the name implies, they’re shaped a bit like a pear with one end wider than the other. They’re also known as teardrop or pendeloque diamonds. The cut is both traditional–the Great Star of Africa diamond that is the centerpiece of the Royal Scepter of England is pear shaped–and modern. Because they are based on both the round cut and the marquise cut, pear shaped diamonds offer the radiance of a round diamond with the subtly flattering shape of the elongated marquise. Consider a pear shaped diamond for a timelessly elegant, but still unusual engagement ring. When shopping for any diamond, keep the “four ‘C’s” in mind: cut, color, clarity, and carat weight. These four characteristics determine the look and cost of the diamond. Finding the right diamond means choosing the one that offers the right combination of “C”s, not simply the biggest stone. This refers not to the shape of the diamond, but the quality of the diamond cutter’s workmanship. The unique brilliance and fire of diamonds is due to the stone’s high refractive index, a measure of how light travels through a substance. In a skilled craftsman’s hands, the cut maximizes that brilliance by allowing light to bounce off facets within the diamond and shine through the top where it can be seen. A cut that’s too shallow or deep will lose light through the base of the diamond, while a well-crafted cut will reveal all of a diamond’s radiance. A well-cut pear shaped diamond should have symmetrical sides and be about one and a half times as long as it is wide. Because pear shaped diamonds are a hybrid of marquise and round shapes, they may exhibit the marquise cut’s characteristic “bow tie” effect, a darker area within the diamond that’s shaped like a man’s bow tie. A well-cut pear shaped diamond will have a lighter “bow tie” or none at all. Although most diamonds appear colorless and clear, many have a faint champagne hue. The slight tint may detract from the diamond’s brilliance, so diamonds that are closest to white are the most valuable. The Taylor-Burton diamond given to Elizabeth Taylor by Richard Burton is a true colorless pear-shaped diamond. Jewelers grade diamonds’ color on a scale from D (colorless) to Z (light yellow). Diamonds in the D, E, and F range are considerably rarer and more expensive, but have no discernible tint to interfere with their fire. The range of colors from G through I are an excellent choice for maximizing a diamond’s brilliance while minimizing its price, as their color is undetectable to the untrained eye. Diamonds ranked J through M have only a faint trace of color and still have a good deal of sparkle, especially if they’re well cut. Consider the setting when choosing a color. A diamond with a faint warm hue will suit a yellow gold or pink gold, but may look noticeably yellow against a white gold or platinum setting. If the diamond will have other stones surrounding it, they can also influence how tinted the diamond will appear. The color scale applies only to white diamonds. Colored diamonds, sometimes known as “fancy” diamonds, are those with a pronounced color. The brilliant blue Hope Diamond is an example of a fancy diamond. These stones are valued for their color as much as their shape and brilliance and are generally more expensive than even the best colorless diamonds. Pear shaped fancy diamonds can be especially stunning, as their greater surface area adds impact to the stone’s natural color. During their formation, most diamonds develop inclusions, small amounts of non-diamond material or tiny air bubbles within the stone. How noticeable those inclusions and flaws are affects a diamond’s clarity. They’re as unique as fingerprints and are often used to identify a particular diamond. Jewelers’ clarity rankings are based on how a diamond appears under a jeweler’s loupe, a series of lenses that magnifies a stone ten times. The rarest and most sought-after diamonds bear an F or IF ranking for Flawless and Internally Flawless, respectively. VVS1 and VVS2 rankings mean that the diamond has very, very slight inclusions, while VS1 and VS2 have (as you might expect) very slight inclusions. SI1 and SI2 grades have slight inclusions. The lowest gem-quality rankings are I1, I2, and I3; these gems have inclusions large enough to be visible to the naked eye. F and IF diamonds are quite rare and therefore the most expensive. VVS and VS are good choices for engagement rings, as their flaws are only visible to a trained eye under magnification. SI-grade diamonds are also worth a look, as the ranking affects the cost of the stone more than it does their appearance. Such diamonds are “eye-clean” and won’t be noticeably flawed unless magnified. Not all inclusions are created equal. A pear shaped diamond with a scattering of black dots at its point may be ranked a VS2 by jewelers, but look more fiery and brilliant to the naked eye than a VS1 diamond that has a cloudy patch in its center. The human eye is the best judge; if a diamond looks clouded and dull like a chip of ice, it doesn’t matter what its designation is. Carats are a measure of a gemstone’s weight. A higher-carat diamond is simply a bigger diamond than a lower-carat one. Pear-shaped diamonds will always have a slightly higher carat weight than a visually similar round cut thanks to its extra point. 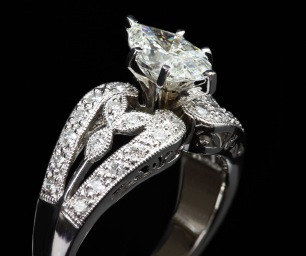 Consider the size of the stone in proportion to the size of the ring and of the hand on which it will be worn. On slender fingers and with a slim band, a one-carat stone will look stunningly large, while a thick band may look better with a larger diamond. A smaller, but brilliant diamond with good color, cut, and clarity may have more visual impact than a bigger, but imperfect gem. Pear-shaped diamonds need a little extra protection compared to their round cousins. Whether the diamond is set as an elegant solitaire or highlighted with additional stones on the band, look for a chevron-shaped prong at the diamond’s point. This specialized prong not only protects the stone from chipping or loosening in its setting, but also keeps it from cutting into anything else including the wearer’s hand. The classic mount for pear-shaped diamonds is the tall, six-pronged tiffany setting. Fewer than six prongs could leave the stone unsecured in its setting, while more than six could obscure some of its fire. Cathedral mounts are another elegant choice, as their graceful curves highlight the diamond in the same way that cathedral arches draw the gaze upward. Cathedral mounts also offer additional protection to the stone, making it a good choice for a ring meant to be worn for life. Expect to pay a bit more for a pear shaped diamond than for the same carat weight round diamond, as the cut involves more skill to look its best. However, a pear shaped diamond will look larger than that equivalent round diamond. Finding a pear shaped diamond engagement ring for under two thousand dollars may be difficult due to the skill required to produce them. Consider the four “C”s and decide which of them is of greatest importance; finding a pear shaped stone with a faint warm tint, but good clarity and cut can save money without sacrificing beauty. Thanks to their greater visual impact, a smaller pear shaped diamond of good quality may be a more cost-effective option than a heavier stone in a more conventional cut. There is no “right” way to wear a pear shaped diamond, only a matter of preference. Wearing the point toward the fingernail subtly elongates the fingers, while wearing the point toward the arm makes the stone look slightly larger. Either way, a pear shaped diamond is one of the few shapes that gives its wearer options. Pear shaped diamonds go well with accent stones in virtually any shape, as they’re hybrids themselves. If the wedding band will also have diamonds, a teardrop engagement diamond flatters round, marquise, and even baguette-style diamonds equally. If we already have the stone to put in the center, how much would the setting cost? I LOVE the engagement ring on this webpage… what jeweler sells it?